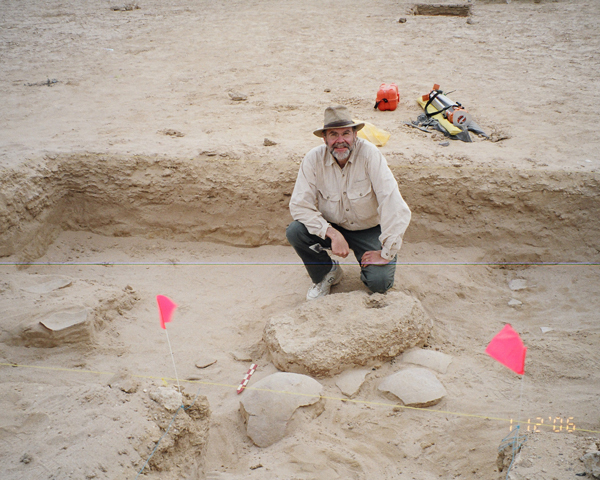 Glen Dash kneels behind a stone anchor that marks the edge of the ancient harbor at Wadi Gawasis. While the Middle Kingdom site of Wadi Gawasis has been known for decades, the exact location of its ancient harbor was unknown. In 2006, the Glen Dash Foundation, working in association with Prof. Kathryn Bard and Benjamin Vining of Boston University and Prof. Rudolfo Fattovich of UNO (Naples), located the harbor using magnetometry.